INCOMING FRESHMEN WERE GREETED by both Save the Union and President Jackson on their way down to the Troy Waterfront where they socialized and listened to speeches. Welcome Fest, Rensselaer’s pre-semester tradition where freshmen shake President Shirley Ann Jackson’s hand, high-five members of her cabinet, and then wind through the streets of downtown Troy before arriving at Riverfront Park, took place on Tuesday. 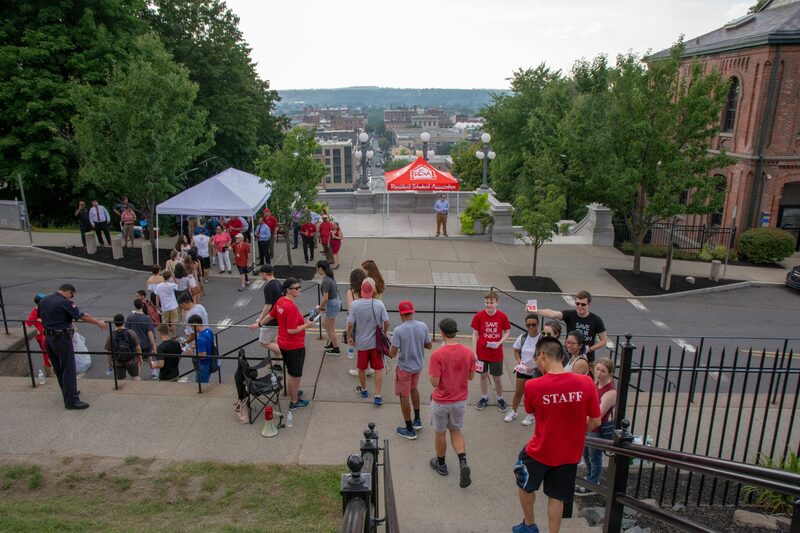 The event is the first time the newest members of the Troy community trek down The Approach, a symbolic gateway between Rensselaer’s campus and the city. But this Welcome Fest had a new addition to the ceremony: students handing out Save the Union information sheets and stickers. They placed themselves on the east side of 8th Street as members of the Class of 2022 crossed the street to be greeted by Jackson, who was on the west side. Florence Abrams—a representative of the ACLU—was present, and she expressed concern that the students could be told to cease distributing their materials or be removed from Institute property. She advised them to remain on public sidewalks and avoid obstructing traffic to ensure that their presence would not be challenged by RPI or the Troy Police Department. Students could be heard shouting “Save the Union!” as they examined the materials they were given. Jackson could also be seen conferring with Vice President for Strategic Communications and External Relations Richie Hunter as they both held a Save the Union flyer. The Save the Union members were not prevented from distributing their materials to the freshman class. Students were supplied with water, sunglasses, and water bottles once they arrived at the Troy waterfront. The first group of students arrived at around 3:40 pm, and the last group arrived around 5:10 pm, leaving some students to sit in the sun for more than an hour and a half. According to multiple freshmen, no warning was given as to how long the event would be or how to prepare. Once the Class of 2022 had congregated, President Shirley Ann Jackson gave her customary speech, followed by speeches from the mayor, Grand Marshal Stef Warner ’19, and President of the Union Justin Etzine ’19 welcoming the incoming students to the Rensselaer community and preparing them for the years to come.